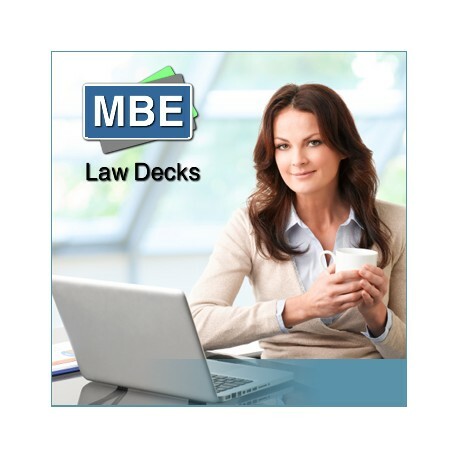 The MBE Law Decks has been expertly developed to help prepare you for the Multi-State Bar Exam. It focuses on the test-taking component of the test, including critical thinking, rationale, timing, and content review in a practical setting. 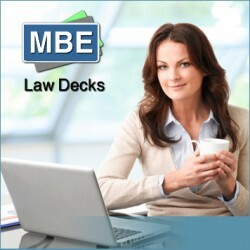 The MBE Law Decks was developed by a former Bar Examiner and his law firm. It focuses on preparing you for the MBE by improving test-taking skills on many levels, including your timing. The primary focus is critical thinking and rationale. Understanding how the MBE works and giving you an insight into the mind of the test writers is a critical component of improving your test-taking skills. Additionally, we help you review the content covered in a practical legal format to give you a working understanding of the legal content you'll be covering. This content includes, Constitutional Law, Contracts, Criminal Law, Evidence, Property Law, and Torts. Finally, we include various technologies that track your progress as you go through the content to give you a real-time view of your knowledge base. This will allow you to focus your studying accordingly so that you're more efficient in your preparation. Preparing for your MBE has never been more effective and efficient! At the price of $229, you can't afford not to take advantage of this online tool. Let us help you get started on your law career with this invaluable study aide as you prepare for your MBE!